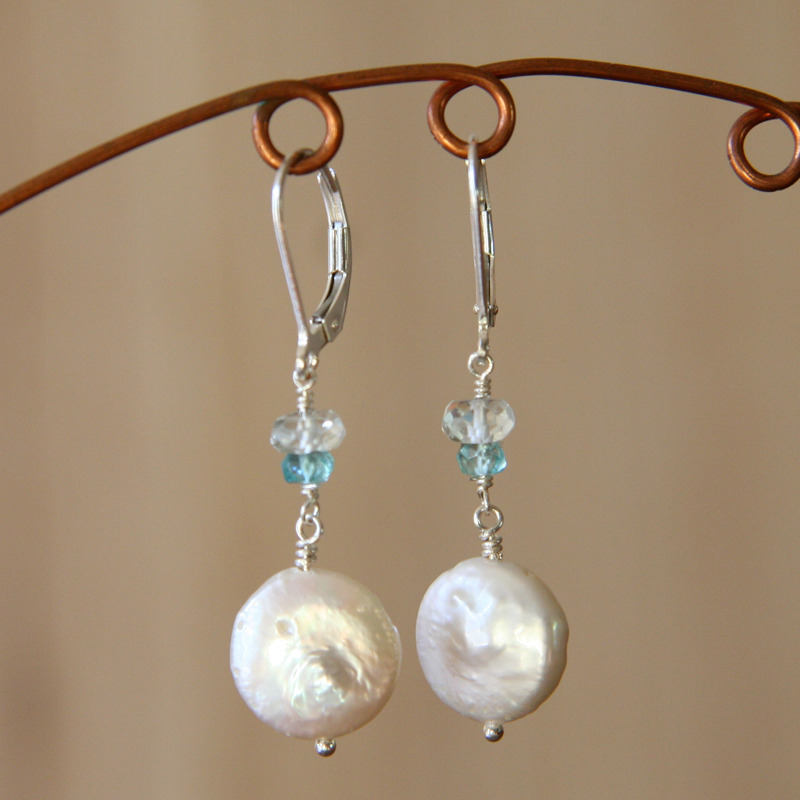 White coin pearls dangle below a watery combination of aquamarine and apatite rondelles. Leverback earwires. All silver is sterling. Approximately 1 3/4 inches, including earwire. .......................................... Symbolizing innocence and purity, pearls are said to promote faith, charity and integrity, especially personal integrity. They are considered to offer the power of love, money, protection, luck and to cement engagements and love relationships. Aquamarine is said to bring harmony, promoting clear and logical thinking that helps banish fears, calm nerves, and impart strength and control. It also imparts purity to the wearer, as well as encouraging the gentle nature and personality in the wearer. It is a symbol of peace. .......................................... These earrings are hand-made to order. Slight variations are the nature of handmade jewelry and make each piece special. Earrings will be shipped with a complimentary organza gift bag. If you prefer a gift box, please let me know in the Notes box at checkout. If you are purchasing a gift that you would like shipped directly to the recipient, I am happy to include a personal message from you. In the Notes box of the order form, mention "giftshipper" and include the text of your note.